I started practicing Ashtanga yoga on my own in my bedroom, and also in hotel rooms whilst travelling with work. After about 18 months of a rather unorthodox approach I went to my first Mysore class and had my mind blown by the grace and subtlety of those practicing. It was only after this that I started to look beyond the shapes to find the more subtle qualities of Ashtanga’s method and practice in a way more akin to the traditional counted method. Practice has taught me a lot; first and foremost patience, closely followed by well-humoured humility. I spent much of my childhood stomping around the Lake District and the Scottish Highlands, something I still do a lot of. Over the years this developed in to a passion for the outdoors in particular rock climbing. I’ve travelled extensively round the world, from China to the Cheddar Gorge to satiate my appetite for exploring the natural world. Like the methods of yoga, getting outside and interacting with mother nature becomes a deeply rooting endeavour allowing space for our animal instincts to come to the fore. As a byproduct of all the climbing I’m know the carer of a number of injuries. 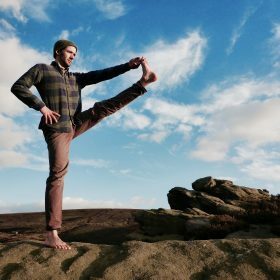 Torn ligaments, dislocated joints and big bruises have influenced my yoga practice massively and have shown me how regular practice can nurture the mind and body through times of fragility to help bring them back in to balance. Injuries have also meant I’ve had lots of opportunity to explore postural adaptations and a little experimentation with sequencing. For the 6 years I have been practicing, the majority of my time has been spent without the guidance of a teacher but have come to understand the equal importance of practicing with a more experienced person in a class environment. In early 2016 I went to Indonesia to practice with Iain Grysak for six months, a teacher whose personal philosophy and nature I have a lot of respect for. Alongside this I’ve also spent time studying with John Scott and have completed my teacher training with him. I teach in a way that mirrors my ongoing experience with practice; employing a healthy dose of childlike curiosity alongside a more disciplined formal structure. Yoga is one of the many platforms that when approached sincerely can allow you to get under your own skin and spend time with yourself.